Swiss pioneers Bertrand Piccard and André Borschberg are ready to resume their attempt to achieve the first ever Round-The-World Solar Flight with Solar Impulse 2 (Si2) – the first solar airplane capable of flying day and night without using a drop of fuel. After replacing overheated batteries and running maintenance flights, the team is now re-entering “mission mode”, and as of tomorrow, will identify the first favorable window for Bertrand Piccard to fly toward North America, despite the current difficult weather conditions. The goal of this entire endeavor is to demonstrate how modern clean technologies can achieve the impossible. 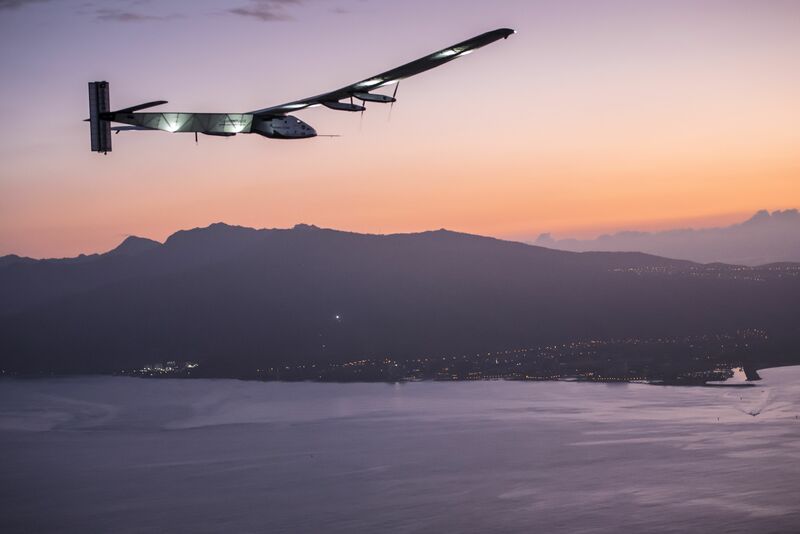 On 3 July 2015, Si2 landed in Hawaii after a record breaking flight of five days and nights (117 hours and 52 minutes) and around 8’900km from Japan, accomplished by André Borschberg. During this flight, the airplane suffered battery damage due to overheating which led to an unforeseen pause in the adventure – it was going to take the team more time to replace the batteries than the remaining time left before the end of the season with long enough days, and short enough nights, to continue the Round-The-World Flight. Solar Impulse was fortunate to find a shelter to protect the airplane during the winter on Kalaeloa airport, thanks to the University of Hawaii, the Honolulu Community College and the Department of Transportation, and received valuable support from many people and institutions, such as the Governor of Hawaii, the authorities of Kalaeloa and Honolulu airports, and the Swiss Consulate. Between late February and mid-April 2016, Si2 accomplished a total of 13 flights. Maintenance flights, carried out by Solar Impulse’s test pilot, confirmed the good performance of the aircraft and proper functioning of the newly integrated cooling system, installed to safeguard the batteries from temperature-related glitches. They were followed by a series of training flights completed by both pilots: André Borschberg and Bertrand Piccard, including a high altitude flight, in order to prepare for the remainder of the Pacific crossing (watch the video here). When the weather is right, Si2 will resume its Round-The-World Solar Flight and take off for North America with Bertrand Piccard at the controls. The team is examining four potential destinations: Phoenix, the San Francisco area, Los Angeles and Vancouver. Based on the learnings of 2015, the decision was made to expand the range of potential destinations to leave a maximum flexibility for route planning. The final landing place will be chosen a couple of days before departure depending on the weather conditions. The mission will then continue onward to New York, Europe or North Africa and Abu Dhabi where it all started. To be informed when the departure date is confirmed, subscribe here.